World’s Fairs are an unforgettable event in a city’s history, bringing scores of tourists, revenue and prestige for years after the fair. If you’ve ever seen Meet Me in St. Louis, you’ve experienced Hollywood’s take on the World’s Fair in St. Louis, Missouri in 1904. 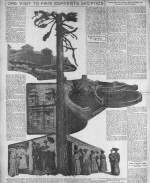 If you’ve ever wondered what the reality of a fair might look like, you can search many historic U.S. newspapers of the era at http://chroniclingamerica.loc.gov/ for first and second-hand accounts of U.S. World’s Fairs. “An Army of Men,” Morning Oregonian, November 18, 1904. 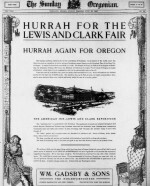 “Congress Asked to Give $2,125,000 for Lewis and Clark Fair,” Morning Oregonian, October 06, 1903. “The Park Possibilities of the Lewis and Clark Exposition Site,” The Sunday Oregonian, October 30, 1904. “Concessionaires Lose Heavily,” Morning Oregonian, October 16, 1905. 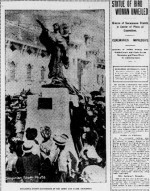 “The Lewis and Clark Centennial,” The Sunday Oregonian, May 24, 1903. You can also find more images of the Lewis and Clark Centennial Exposition in the shared OSU/UO Digital Collections website, like this photo of the States Building, or this colorful postcard of the Agricultural Building.